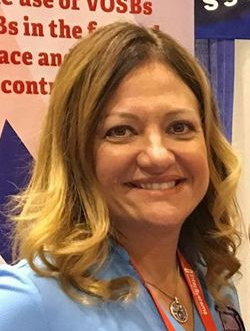 Heather Hayes is a 1995 graduate of San Diego State University with a Bachelor of Science Degree in Kinesiology. She was commissioned in the United States Marine Corps in 1995 and served on active duty from 1996 to 2001, then was recalled and served again in 2003. During her time on active duty she was stationed in Quantico, Virginia; Camp Pendleton, California; Camp Lejeune and New River Air Station in North Carolina. She was amongst the first wave of female Marines allowed aboard ship and served with the 22d Marine Expeditionary Unit from 1999-2000 aboard the USS Bataan (LHD-5) where they were in support of Kosovo Operations. During the recall, she worked aboard Camp Pendleton that was activating and deactivating Marines in support of Operation Enduring Freedom and Operation Iraqi freedom. After the military, Heather became the Vice President of Inland Wholesale Flowers, Inc. A wholesale floral distributor to a large region in Southern California. With a background in administration, she worked all aspects of the business to include, HR, purchasing, sales, accounts receivable, accounts payable, managing staff and customer relations. During this period she was heavily involved in the International Floral Distributors and coalition of wholesalers around the country working together to achieve greater success. In 2011, Heather began working part time with the National Veteran Small Business Coalition, at that time membership was about 35 strong. The Coalition was part time, so she continued to work for other companies in the federal space. She was the West Coast Administrative Manager for Knight Solutions overseeing administration for eight National Cemetery contracts. In 2013, Heather began working with Cotton Medical Group, LLC as a Contract Support Manager. A liaison between the manufacturer of a medical device and the VA and DOD facilities. Primarily focusing on the West Coast but was involved with over 75 hospitals and medical facilities nationwide. By 2016, The National Veteran Small Business Coalition had grown to a place where Heather was offered full time employment. Today she is the Administrative Services Manager, where she oversees the administration of the Coalition, which has grown to 500 members strong. She is active in the community as a room parent at her daughter’s school as well as a Girl Scout leader to a troop of 12 girls. She is an active member of the American Legion, the VFW, MOAA and DAV.